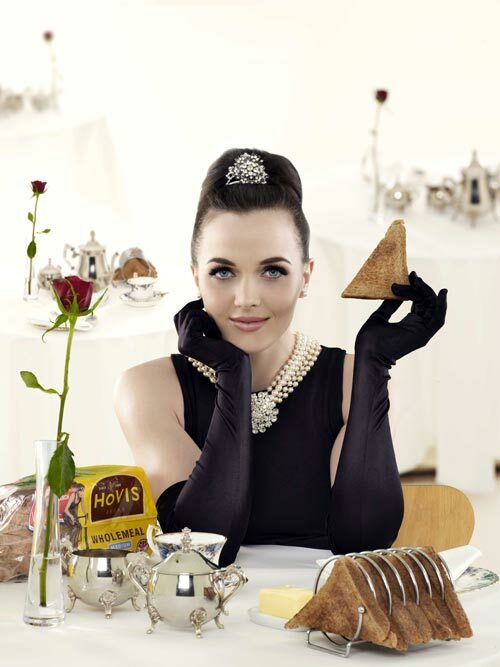 British track star Victoria Pendleton appears as the Audrey Hepburn character Holly Golightly from the 1961 film ‘Breakfast at Tiffany’s’ to launch a new campaign for Hovis bread. The film established Hepburn as a bona fide star and icon of the Sixties. Pendleton’s authentic dress and make-up recreate the era, but with Hepburn’s character’s trademark cigarette holder replaced by a nice slice of brown bread. Far more healthy. It’s all in aid of promoting Hovis’s Wholemeal Breakfast Week, aimed at encouraging people to – unsurprisingly – eat wholemeal bread for breakfast. The campaign follows recent research which apparently showed that working mums are on the go for three hours before they even reach work, burning up 500 calories. Many skip breakfast. “A substantial breakfast is a vital part of my training so I make sure I never skip it,” Pendleton said. World and Olympic track champion Pendleton signed a three-year deal with Hovis to help the bakery promote its brands.